1. 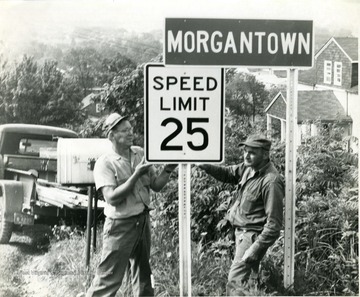 Installing Speed Limit Signs on College Avenue, Morgantown, W. Va. 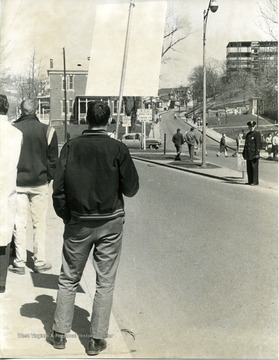 Installing Speed Limit Signs on College Avenue, Morgantown, W. Va.
Mr. Smith (left) and Harry Franks (right) putting up a speed limit 25 sign on College Avenue. 2. 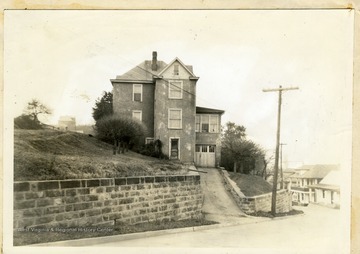 Home located at 800 College Avenue, Morgantown, W. Va.
Home located at 800 College Avenue, Morgantown, W. Va.
Monongalia County Building and Loan Association. District: Fifth Ward. From Whom Acquired: Dooms, E.D. Address of Property: 800 College Avenue. Description: Lots 1, 2, 3, 4, Bk A University Avenue. Improvements: Dwelling, six rooms and bath, stucco construction, slate roof, hot water heat, garage. 3. 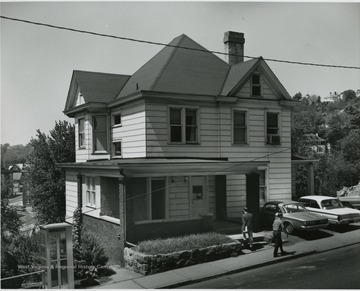 Home located at 723 College Avenue, Morgantown, W. Va.
Home located at 723 College Avenue, Morgantown, W. Va.
Monongalia County Building and Loan Association. District: Fifth Ward. From Whom Acquired: Smith, Homer Lee. 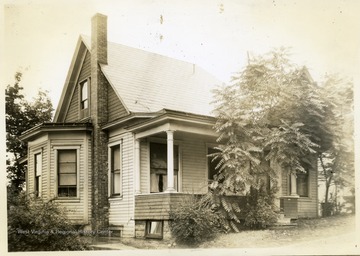 Address of Property: 723 College Avenue. Description: Lot 3 Kife Plan 45 x 99 x 65 x 93.9'. Improvements: Dwelling with nine rooms and bath, frame construction, slate roof, furnace. View of the east side of the Agricultural Experiment Station Building. 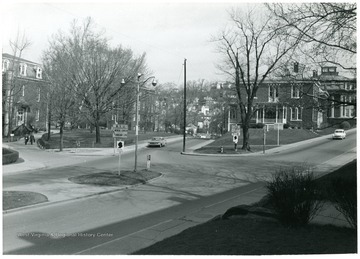 Three early automobiles are parked on College Avenue across from the building. Agriculture Experiment Station and Oglebay Hall are present in the photo. 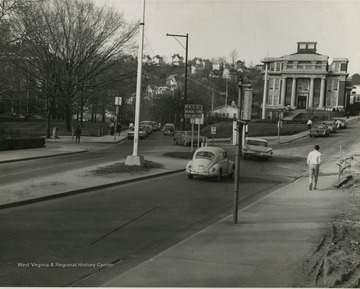 View of University Avenue at its intersection with College Avenue on the WVU Downtown campus. Grumbein Island in center of street. 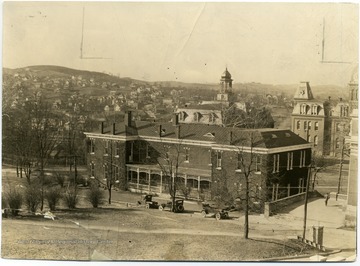 Martin Hall, Chitwood ('Science') Hall, and WVU Agricultural Experiment Station buildings visible. 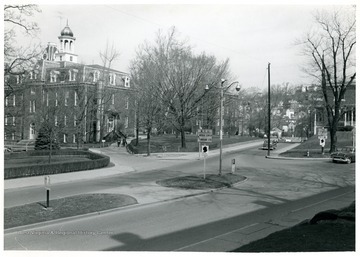 View of frame building on College Avenue above Oglebay Hall. 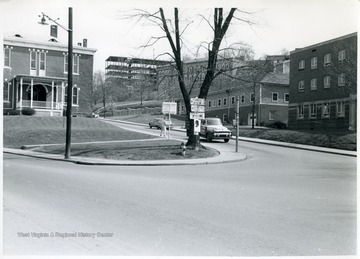 It was the location of the Housing Office. 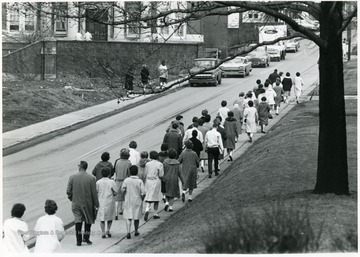 After 1957. 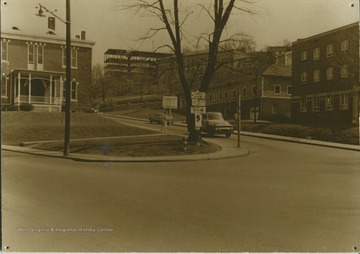 WVU campus buildings from left to right, Agricultural Experiment Station, North Wing of Terrace (Dadisman) Hall under construction, Women's (Stalnaker)Hall, Cafeteria, Student Health Center.